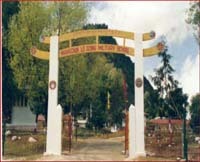 Wangchuk Lo Dzong Military School (WLDMS) The WLDMS was established on 16 Oct 1962 and commenced training with 22 officer cadets and 49 non-commissioned officers. The WLDMS conducts pre-course capsules for different courses conducted at training institutions in India. Initially an officer from Royal Bhutan Army (RBA) was attached to assist IMTRAT with training at the WLDMS.Two officers were subsequently posted to the School in 1974 for the first time and at present, one senior instructor, one assistant senior instructor, one directing staff coordination, demonstration company commander and a company officer are on the staff of WLDMS. Role of WLDMS- To impart military training to the personnel of Royal Bhutan Army and Royal Bodyguards. Physical Training And Sports Training Area. Indo Bhutan Friendship Hospital (IBFH) The foundation stone of Indo Bhutan Friendship Hospital was laid on 04 Jul 1970 by Hon'ble Lyonpo Dawa Tshering, then Development Minister of Royal Government of Bhutan. The hospital was inaugurated by Maj Gen T V Jeganathan, PVSM, AVSM, Commandant IMTRAT On 27 Apr 1973. Facilities at the Hospital- MH Haa provides state of the art facilities for Ultra Sonography, ECG, X Ray, Ventilator, Neo Natal Incubator and Pathology Lab. Facilities also exist for for admitting limited number of civil patients. The Hospital extends all medical facilities to the civilian populace of Haa and adjoining areas free of cost. It treats approximately 100 civilian patients on a daily basis. Mobile Clinic at Haa- A specially designed light commercial vehicle was dedicated by His Excellency Shri Dalip Mehta, the Ambassador of India to Bhutan on 29 Apr 1996. The vehicle has a minor OT, lab and a dispensary besides a portable X ray unit and a dental chair. It is utilised to provide medical facilities to the civilians in far flung areas.